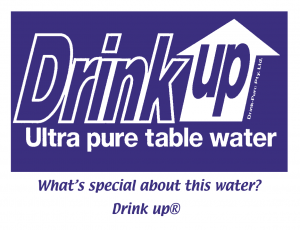 DrinkUp ® pure water has the desirable lively and tasty ‘taste’ of rainwater. It contains less than 5 parts per million (ppm) of total dissolved solids (TDS). The electrolysis probes will not conduct electricity, because there is nothing dissolved in the water to color it as with impure water. So our water will remain nice and clear during the testing – a real testimony to our water’s purity. Consider that all growing plants actually distill (photosynthesise) the water taken up by their root systems. So if anyone tells you to avoid drinking distilled water, remind them of the photosynthesising story and that the water portion of any fruits and vegetables they eat has been distilled. Because of photosynthesis distilling, the consumer won’t see any of the ‘muddy irrigation’ water the farmer used turning up in the water portion of any fruits and vegetables – or bottles of wine – consumed, because all plants photosynthesise (distill) the water absorbed by its roots. It is the photosynthesis process converting the non-usable ‘in-organic’ minerals and metals into friendly ‘organic’ ones acceptable by our body’s cells for health and vitality. It is all part of the process Mother Nature designed for humans and all living mammals millions of years ago. Nothing has changed now that we are into the 21st century. © 2019 Distilledwater.net.au. All rights reserved.